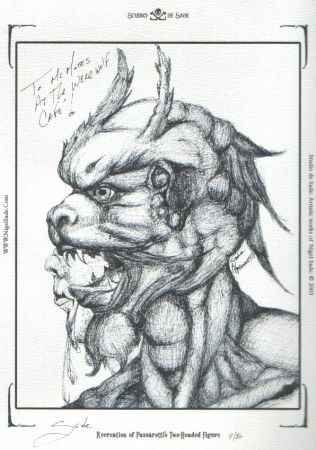 Rex is the werewolf who hangs out over at the www.BloodMoonRisingMagazine.com website and shows up in some of Sapphire Publications' "Werewolf Magazine" issues. 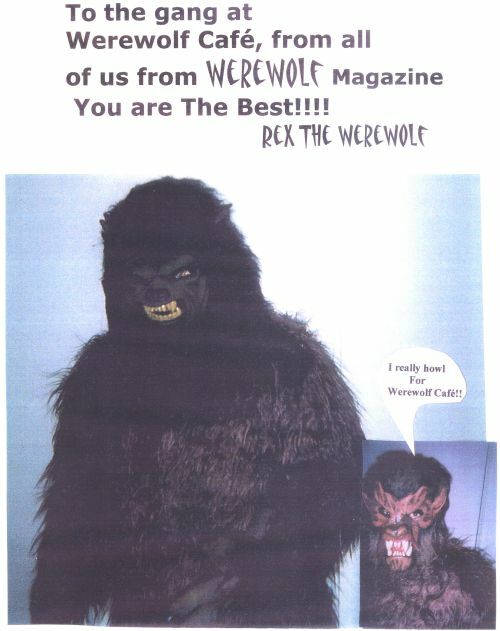 Thank you Rex and Sapphire Publications for this great picture you sent to The Werewolf Cafe! Please check out Sapphire Publications' website at www.BloodMoonRisingMagazine.com and the Sapphire Publications forum on this site here to find out all about their past, current and future projects. Fantastic art at Studio de Sade. I personally own a copy of the Recreation of Passarotti's Two-Headed Figure. This is a recreation of Bartolomeo Passarotti's Two-headed figure. It is a ~17th century masterwork outlining the two faces of man. The Kindly old gentleman and the Beast. this image show that man is often overshadowed by the beast side of his being. 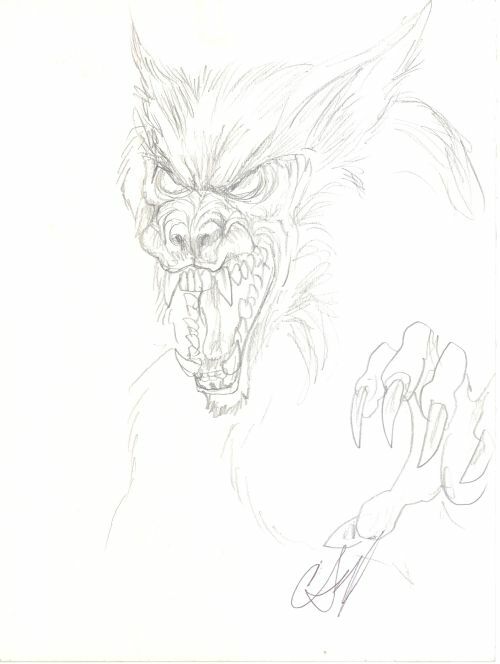 This picture is often regarded as a picture about lycanthropy and the Passarotti had a thing about Werewolves. This piece got Passarotti in a bit of trouble with the church, but nothing as serious as previous artists had to face. For me this piece marked my decision to become a professional artist. I was taking a class in drawing at Kent State University and our day's project was to recreate a masterwork in the medium that it was originally done. Everyone in the class was picking out their pieces and my professor comes to me and says "here your doing this!" and shoves this book at me ... so what do say to that but "K ..." then get to work. upon finishing the general response to the piece was positive! many liked it better than the original (a fact I blame on just doing a tighter hatching). So I figured that if I can merit a response that positive perhaps I should try and do this art thing professionally ... and the rest is history. MoonHowler Productions is a multi-focus creative company that believes that Halloween can be celebrated everyday. Shake hands with you dark side, embrace you inner spookiness and come inside. Not really a werewolf site...but mutesound is the site of Karim, the man responsible for the new Werewolf Café animated splash screen, which you will be able to view beginning Monday, August 2. 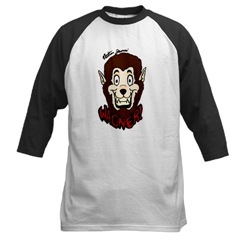 Currently there is a wonderfully funny Wookie bouncing up and down on the site that sort of looks like a werewolf, so I guess it's OK for now. PS...be sure to touch the wookie for the full effect. We've built a section just for you. We hope you like it. Darkness in the News is dark news compiled from all over the web by our good friend, Sean Francis (you've heard of him mentioned here before). As he puts it, his site is depressing to demented, definately not for young readers. Check it out today.